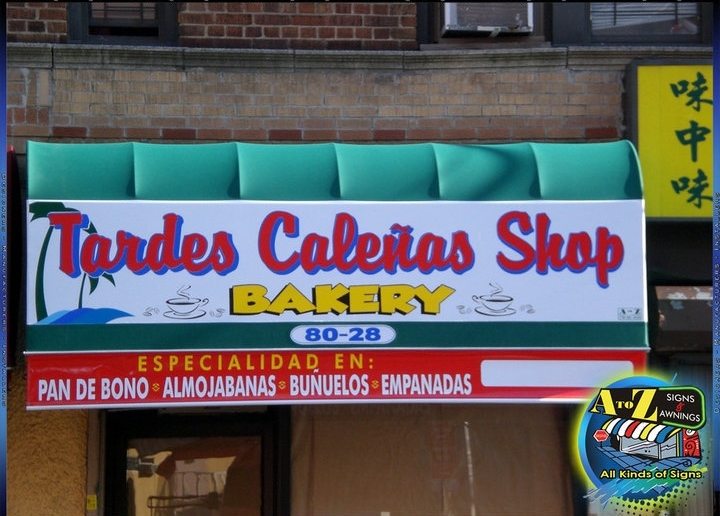 We are small sign company that was established in 2005 in Bushwick, Brooklyn. Over the years, we have established a reputation for designing and producing top-quality signs for our customers, as well as neons, banners, awnings, canopies, light boxes, menu boards, and much, much more. Talk to any of our customers, and you will see that they are satisfied with their custom made signs, courtesy of A to Z Signs. We will guide you in your quest for a new product - be it a sign, awning, or canopy for your business or residence, or lettering for your car, van or truck - from start to finish. We do bike and motorcycle lettering too! I would recommend A to Z. “I had a residential awning installed for my backyard, and worked with Ivan and his team over the summer, and am very pleased with the result. From start to finish, the process was very straight forward, from having an initial free estimate, where Ivan came over to measure the area, and then provided me some swatches to look at, so that we could pick a color, and to view the quality of the aluminum material of the awning. Within a few weeks of placing our order, they came out on a weekend to install the very large awning (about 22'x11'). They worked diligently and nonstop for several hours, with a short break for lunch, but completed the job within one day (about 5 hours), and cleaned up the work area when they were done. The awning looks great, is sturdy, and has withstood the heavy downpour and wind from the recent storm we experienced. Ivan stressed the importance of making sure the awning would be very strong to withstand east coast winters (rain and snow), and I appreciated the thoughtfulness and consideration of that remark. I can only hope that it will hold up against future rain and snow storms, but so far, we are happy with our awning. Pricing was also reasonable, and I would recommend A to Z to those looking to get a residential awning installed." Your new sign, awning, or canopy is waiting. Let us guide you to a new sign, awning, or canopy for your residence or business.